Heidi was very helpful with walking us through our ceremony and picking out what type of ceremony we wanted and what was perfect for us. Whenever I had a question or concern she was very responsive and made me feel comfortable. I would recommend Rev. Heidi Dupree to anyone. She was so helpful, nice and easy to work with. My husband and I appreciate all she did to make our day special. She helped to ease some of my wedding planning stress by helping us find a venue we both loved. Thanks so much Heidi! 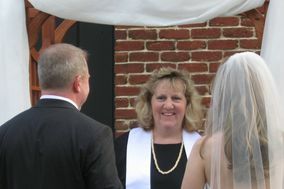 Heidi was a fabulous officiant for our wedding. She helped us craft a unique spiritual ceremony that was perfect for our families' different religious backgrounds. She was also extremely responsive and helped us by handling marriage license paperwork and even bringing a small PA system. We were lucky to have found Heidi and highly recommend her! We couldn't have been more pleased with everything Heidi did to make our wedding so special and full of positive energy. She went above and beyond to make sure everything went as smoothly, and stress-free, as possible throughout the entire process (from the vow creation to the wedding service). I would absolutely recommend her officiant services - she is amazing! The ceremony was beautiful,Im so grateful for rev.Heidi that she made this special day perfect!